Terenia Offenbacker's philosophy is anchored in free expression and the sharing of a unique vision with others. She loves the surprises inherent in mixed media projects, especially those that involve paper, and oil portraits based on Old Masters techniques. Ms. Offenbacker grew up in Poland, were she attended the Universities of Szczecin and Poznan; graduating with degrees in Art Education and Art History. 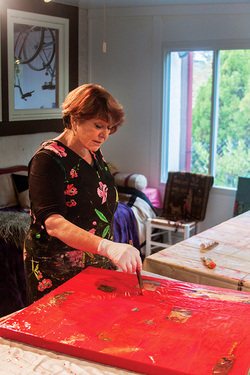 She left Poland in the 1970's to study in Santa Cruz, putting on hold an early career as an art teacher. The trip to California was to be a short one, but instead turned into a permanent stay. Over the last 30 years, Ms. Offenbacker has worked in Silicon Valley; first as a designer in the computer industry and later becoming a Vice President of Marketing and Sales for a professional staffing agency. During this time, she avidly collected art from around the world. Today she lives in a Los Altos Hills and has decided to return to the world of art where her passion has always been. When not in her attic studio, she is out at the beach with her two dogs or planting freesias and gardenias alongside the marjoram and purple basil in her home garden. She hopes you will enjoy her artwork as much as she loves creating it. Always visit our Facebook Page for our most recent works and updates on upcoming shows!